Clichés to Avoid: The athlete or competitor who will win at all costs and leave behind a body count to do it; the ex cop with a vendetta; the military Rambo type who was wronged and is determined to bring his government down; the character who wants something outlandish and who is not suited for the task, yet manages to achieve it through an incredible amount of fortunate coincidences and luck. The darker cousin of determination is obsession. It’s easy to show obsession leading to a person’s undoing, so instead, show us a hero who buries himself in it, but then realizes what is happening and pulls himself out in time. With villains, determination is intrinsic and so readers take it as a matter of course. This means some authors skim on defining WHY the villain is determined, so if you write this trait, don’t skimp! The WHY is what creates empathy, so show us the cause, the need, that lies behind striving to obtain their goal. Determination can never be enough. Challenge your character morally, and add conflict that makes them question their choice and mindset. Self-doubt can be a powerful way to define determination. I’m reading WHERE IT BEGAN by Ann Stampler right now and I love the way her MC Gabby is determined to recover her fragmented memory to explain her current predicament. Great post, as always! I’m adding OKAY FOR NOW to my TBR book list. A trait that could cause problems if left alone. Being focused on one thing could lead to all sorts of trouble. Good one. Hi Shelly–great to see you here! Susan, you are too kind–thank you! 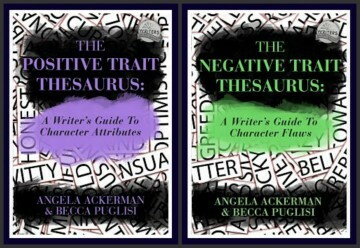 And yes, the response to the Emotion Thesaurus has been strong enough that Becca and I will be releasing more books! Thanks so much for your support! Heather, I love it when I read something and BAM, an idea slaps me right upside the head! Woot! That’s awesome. Excellent post, as always. I was (ahem) determined to pop in to tell you guys how very much I love your book. It’s a great reference, and ya know what? You have more than enough material on this blog to fuel a few more books. (hint, hint) And I hope you do just that. Heard about you guys via PK Hero’s blog.